A marble threshold is an eye-catching floor accent. It is beautiful as well as functional, adding to the overall appearance of the room or doorway. Marble is often used for transition thresholds because it complements other natural stone features such as flooring tiles and windowsills. However, thresholds can present a tripping hazard if not installed properly or are of exceptional size. The Americans with Disabilities Act, abbreviated as ADA, has strict regulations about the size and shape of transition saddles. These regulations are in place for the safety of pedestrians and those who are confined to wheelchairs. A threshold is a strip of material separating two different flooring surfaces. Usually placed in a doorway, these transition saddles can be made of wood, ceramic, marble, granite, or travertine. Marble is the preferred material because it is strong, scuff- and fade-resistant, and acts as a moisture barrier. The flooring surface transition may be hardwood-to-stone, hardwood-to-carpet, or carpet-to-stone. Normally, the two different surfaces are of equal height. Where the discontinuity occurs, a seam exists that could allow moisture to percolate through to the subfloor. A marble threshold prevents moisture percolation. The strip of natural stone is mortared directly to the subfloor and nestles against both of the adjacent flooring surfaces. Commonly placed in a bathroom doorway, the threshold prevents water from seeping into the crack between flooring surfaces. If the threshold is thinner than the carpet or stone tiles, a dip exists that becomes a collection point for water and dirt. Therefore, most thresholds are cut to a thickness of about 5/8-inch. This is approximately the same thickness as the carpet or flooring tile. When mounted on a bed of mortar, the threshold is now raised to an elevation slightly above the level of the floor covering. The ADA specifies that only a sloped upper portion of the threshold can rest at an elevation above that of the flooring surface. This allows for easy pedestrian traffic while at the same time maintaining an effective seal. The actual height of the threshold varies slightly depending on the thickness of the tile or carpet as well as the depth of the mortar bed. Marble thresholds are placed directly on mortar that is spread on the subfloor. Most thresholds have a 3/8-inch base that, when added to the thickness of the mortar, equals the elevation level of the carpet or tile. Only the beveled section of the threshold extends above this point. The ADA requires all thresholds installed in the United States to extend no higher than 1/4-inch above the flooring surface. This portion of the threshold must be beveled. If the flooring surface junction results in a higher elevation on one side of the threshold, an additional 1/4-inch exposed height is allowed on the lower side. This effectively creates a ramp across which wheelchairs can safely pass. A 3/4-inch exposed elevation is allowed for thresholds placed in entryways where an exterior doorframe is mounted next to a carpeted or tiled floor. The type of stone saddles used in this situation depends on the flooring surface material. For example, a single Hollywood bevel threshold with a longer, gentler 1 3/8-inch beveled edge can be used if the entire floor is covered with tile. Trips and falls are common accidents in a residential or commercial structure. Most falls are the result of pedestrian traffic being hampered by differences in flooring surface elevations. Exposed seams of fabric can also cause tripping. A marble threshold helps to prevent trips where a fabric-to-tile junction occurs. It is vitally important for installers of flooring surfaces to comply with these ADA regulations. Lawsuits are expensive, especially where personal injury is involved. Contractors are subject to investigations by OSHA, and fines for ignoring the regulations set forth by the ADA can bankrupt even the largest of construction companies. Stonexchange is a direct importer and distributor of premium quality marble thresholds. Our company owns and operates fabrication centers located in the Mediterranean region, and we import large quantities of thresholds throughout the calendar year. All of our transition saddles meet ADA requirements for safety. Our marble thresholds are cut from large stone slabs. They are trimmed down to 5/8-inch or less in thickness, machine-cut to exacting length and width dimensions, and polished prior to packing and shipment. We offer these beautiful threshold strips in a variety of sizes and styles, and our line of finished products include the most popular color shades requested by clients. Stonexchange carries a line of black granite, cream/beige, and off-white marble thresholds. These are the colors most often used in residential and commercial interiors because they complement other interior accents nicely. These shades also offer property owners the greatest amount of leeway when redecorating and refurnishing is contemplated. One of the problems encountered by installers who obtain their marble strips from a U.S.-based manufacturer concerns the thickness of the product. Many stone strips are cut to 3/4-inch thickness and are therefore unsuitable for fabrication into thresholds. All of Stonexchange’s thresholds are cut to ADA required thicknesses at the manufacturing center and require no additional trimming. 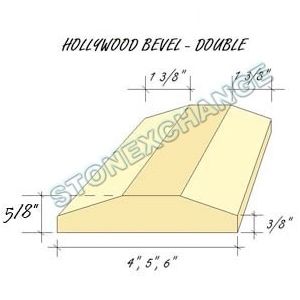 Our company produces standard double-bevel transition saddles and Hollywood bevel thresholds. The standard thickness is 5/8-inch except for our narrow, 2-inch wide standard double-bevel saddles. All three of these styles are available in various standard widths up to six inches, and the standard length is 36 inches. Absolute Black Granite thresholds from Stonexchange are similar to and replace Galaxy or China Black. Our Crema Sahara Marfil thresholds are the same color shade as Turkish Bursa or Italian Botticcino. Our Nuevo White Carrara thresholds are off-white with gray streaking, the perfect replacement material for Alabama White, Cherokee, or Vermont marble. A strong sealant to contain heating or air conditioning. Water leakage prevention from rain and snow. Tiny insects, spiders, and any other vermin from entering. Gaps that could result in light filtration. Whether in a family home or in a commercial setting, we provide the quality you would expect of any other threshold installation. If you have a unique project in mind, head over to our contact us page where we’d be happy to consult further. Our thresholds are packed into crates at the manufacturing center. These crates are loaded into marine transport containers and delivered to our distribution center in Miami, Florida. Customers requiring several crates or pallets (approximately 200-2,000 individual pieces) can order their product directly from our warehouse facility. Stonexchange maintains a large inventory of all the various threshold styles we manufacture. Exceptionally large orders can be shipped directly from the manufacturing facility to the customer. Non-standard size thresholds are fabricated at no extra cost to the client, and these orders are generally delivered from the manufacturing center to the customer within a 60-day time frame. The marble thresholds produced and sold by Stonexchange are pre-polished and ready for immediate placement upon delivery to the client. As previously mentioned, the standard 5/8-inch thickness is perfect for placement on a thin layer of mortar. The resulting height is approximately 1/4-inch above the elevation of the tiles, carpet, or hardwood. In addition to our line of marble and granite thresholds, our company also manufactures and distributes saddles made from travertine. We also carry a line of pure white engineered composite glass/resin transition saddles. These are sold in bulk quantities as well. Our travertine thresholds are available in standard double-bevel, single- and double-bevel Hollywood styles. These thresholds have been honed and filled, and they contain a sealing compound that makes them virtually waterproof. Our pure white Thazoz product is perfect for projects specifying Thassos marble. Engineered stone is 100 percent waterproof and provides the most effective moisture barrier of any composite product on the market. When properly installed, all of these products are in compliance with ADA regulations. Our standard double-bevel thresholds are narrow enough for easy pedestrian passage, and our Hollywood-style thresholds are perfect for placement in doorways where wheelchair traffic is expected. What is an ADA sill? 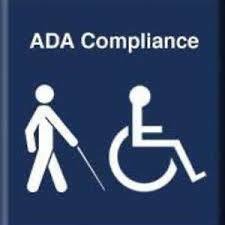 What is an ADA violation? Violations of ADA accommodations typically involve not providing access and/or amenities in public places for those persons with disabilities. Under the Americans with Disabilities Act of 1990 (ADA), businesses and governments it is mandatory to make accommodations for persons who are legally disabled. According to the ADA, a person with a disability is defined as one who has a physical or mental impairment that severely limits one or more major life activity. This extends to those who have a history of such impairment, even if they currently do not display any disability. How many ADA bathrooms are required and how big does it have to be? As the number of occupants increases, so does the number of toilets and lavatories an establishment is required to have. In addition, the ADA Regulations stipulate that you need at least one ADA restroom per gender. For both restrooms, you would need approximately 56 square feet for 2500 square foot or less space in order for it to be ADA sized. The space can be designed for forward or parallel access to the bathroom equipment, with part of the area underneath the equipment if need be, so long as there is enough space for the person’s knees and toes while in the wheelchair. What size door is ADA compliant and how wide does it have to be? By ADA standards, the clear width of a door opening needs to be between 32 inches and 48 inches. This is calculated using a ‘clear width measurement’ and is taken by measuring between the face and stop of the doorframe while the door open 90 degrees. When double doors are used, at least one of the doors should be 31.5 inches wide. As a note, although automatic doors provide greater accessibility, they are not required by the ADA Standards and thus have no measurement specifications. Stonexchange offers the lowest per-piece pricing in the industry. This is possible because we sell mainly to commercial clients such as flooring company retailers, factory outlet stores, home improvement centers, and construction contractors. All of our products are sold with a minimum piece count requirement for the buyer. We own our products from the moment the raw material is extracted until the manufactured accessory is in the hands of the buyer. We do not purchase material from brokers, meaning that our clients are dealing directly with the materials’ source. We guarantee quality satisfaction as well as absolute compliance with ADA regulations. Contact us today and get an accurate cost quote on premium-quality marble thresholds sold in bulk. You can have truly wholesale per-piece pricing on the finest stone thresholds available anywhere. Stonexchange is the source for quality natural stone in the United States and the Caribbean.